Yesterday, the Dow Jones Industrial Average topped 25,000 for the first time, but more importantly, a day earlier The Wall Street Journal reported that the U.S. factory sector posted one of its best months of the economic expansion as sales hit a 14-year high, the latest sign economic growth is picking up. To illustrate just how steep the market’s upward trajectory has been, the Dow broke above 24,000 for the first time on Nov. 30, or 35 calendar days prior to hitting 25,000. It also took the Dow just 35 days to rise from 20,000 to 21,000 last year. CNBC reports the 30-stock Dow index climbed 152 points in one day, with big employers such as General Electric, DowDuPont, Merck and IBM rising about 2 percent. But, more important than the Dow’s rapid rise, the Institute for Supply Management said Wednesday that a key manufacturing index rose 1.5 percentage points from a month earlier to a reading of 59.7 in December, the second-highest level since early 2011. A subindex of new orders—a measure of sales at factories—rose more than 5 points to 69.4, the highest since early 2004. "The Dow hitting 25,000 was a pretty wild idea even a year ago. And while its symbolically important, the real story is never just a number. It's the underlying strength that is pushing markets this high," said Steve Claussen, vice president of trader strategy at E-Trade. 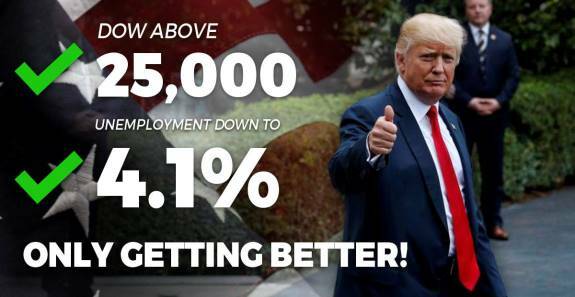 The U.S. private sector added 250,000 jobs in December, ADP and Moody's Analytics reported before the opening bell and CNBC reports economists polled by Reuters expected a gain of 190,000 jobs when the official government numbers are announced. Economists surveyed by Bloomberg see U.S. employment gains slowing to 154,000 a month by the fourth quarter from roughly 176,000 a month in 2017, according to the median estimate in a survey last month before the tax bill passed. The reason: workers are just becoming more scarce. Thirty percent of small-business owners had job openings they couldn't fill in November, according to the National Federation of Independent Business's monthly survey. Hiring qualified workers was ranked as the second most-important problem, after taxes. "I hear anecdotes from firms that tell me they're having a hard time finding workers," Fed Chair Janet Yellen said last month. "We expect the pace of job gains to moderate over time." The Federal Open Market Committee continues to expect the tightening labor market to show up in higher wages and inflation over the medium term, according to minutes from the committee's Dec. 12-13 meeting, released Wednesday. Most participants reiterated support for gradual interest-rate hikes. Trump has predicted his tax plan would contribute to higher wages, which has been largely missing from the expansion. Average hourly earnings likely rose 2.5 percent from a year earlier in December, unchanged from November's pace, and below the gains of more than 3 percent prior to the 2007-2009 recession. "This gets us better wages, bigger paychecks, lower taxes," Trump said last month. Some economists agree with the president, at least for the current year. "Last year's slowing in job growth was the natural result of an economy that is running out of spare labor," said Michael Feroli, JPMorgan Chase & Co.'s chief U.S. economist. With the tax overhaul boosting growth modestly, "it is reasonable to conjecture that the effect of higher labor demand may be more apparent in higher wages than in faster job growth." Translation: The forgotten working folks who voted for Donald Trump are seeing the benefit of his economic policies in more hours, especially in the manufacturing sector, higher wages and more job security in the outlook for new orders. However, the outlook is not rosy for all employers and employees. Retail is getting hit hard by the continuing growth of online sales and traditionally labor-intensive retailers like grocery stores are testing robots and other forms of automation that will reduce employment in those sectors. Matching labor skills with job openings will be a continuing challenge as the retail sector changes and the role of traditional on the floor service and sales workers changes with it. Democrats will ignore this good news or call it trickledown economics, but the forgotten working families of America will likely see the Trump economic boom as the best Christmas they’ve had in a long time.